Raise Funds for Pets: 101 Ideas That Work! If you work for a non-profit humane society or pet rescue group, you understand the importance of fundraising to your long-term survival. Running a rescue or humane group is expensive. You need money for food, veterinary expenses, and countless supplies. For most rescues and humane groups, adoption fees don’t even come close to covering the costs for everything you need. You need to fundraise to keep going. Many humane groups fold because they simply run out of money and the energy to raise funds. But fundraising doesn’t have to be an exhausting grind. In fact, it can even be fun! A new book called Funds to the Rescue by Susan C. Daffron is written specifically for humane groups. 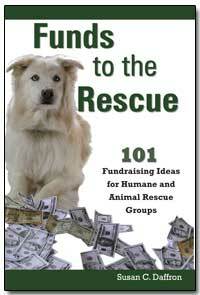 This book saves you from wasting time as you search for new revenue streams to support your humane organization. “Fundraising is a challenge for those of us working to help the animals. planning time and how many people it takes to get them done. This book is a valuable resource for both start ups and established groups. What’s in Funds to the Rescue? The book begins with “The Hows and Whys of Fundraising” and follows with 101 entertaining and creative ideas. How working with restaurants can net big profits, like the shelter that told everyone to “Eat for Pete” (who is a cute dog, by the way). How you can creatively ask for money using a simple letter-writing campaign instead of a bake sale, picnic, or dog walk. One SPCA made $980 the first day they used this tip. How to use nothing more than card stock and your printer for a quick and easy fundraiser. And 96 more! Armed with these 101 fundraising ideas, you’ll never struggle to find the money you need to support your shelter or rescue again. Check Out this Award-Winning Book! Funds to the Rescue also won a 2010 APEX Award of Excellence in the Books and Ebooks category. APEX Awards are based on excellence in graphic design, editorial content and the success of the entry in achieving overall communications effectiveness and excellence. Many books on fundraising don’t offer specific and straightforward ideas for pet-oriented fundraisers, but Funds to the Rescue is written specifically for humane groups. Author Susan Daffron was the founder of the National Association of Pet Rescue Professionals, an organization that offers tools and information to help rescue groups save more companion animal lives. As an animal shelter volunteer, employee, board member, and later as a vet assistant at a low-cost spay/neuter clinic, Susan worked on many animal-related fundraisers herself. Susan was in charge of the local animal shelter’s public relations. During her tenure, she created literally hundreds of marketing materials for fundraisers and communication, including newsletters, brochures, flyers, a brand new Web site, banners, forms, reports, and press releases. While she was involved with the organization, the visibility of the local animal shelter skyrocketed within the small community (read more about Susan on the About the Author Page). Fundraising Doesn’t Have to Be a Struggle! Rescue groups that continue to struggle year after year often treat their organization like a hobby. They may set up occasional, haphazard, or scattershot fundraising efforts and become frustrated with their results. Funds to the Rescue gives you an understanding of the “big picture” when it comes to fundraising. After all, non-profit does not mean no money. You need money to survive. If you’ve been making excuses like , “the economy stinks” or “I can’t think of an easy fundraiser”…stop it. With 101 ideas, you can create a plan that works for you for an entire year. The reality is that without a fundraising plan at most non-profit humane groups eventually the founders get burned out and the organization folds. But the real losers are the animals that are no longer being helped! It doesn’t have to be that way. Fundraising is not new and countless humane organizations have figured out ways to successfully raise money for the animals, no matter what economic indicators are doing. Many of them are mentioned in Funds to the Rescue. You’ll be inspired by their success and realize that the time to start your own fundraising program is NOW. Start Raising More Funds Now! If you are curious what’s included in the book, check out a PDF file that contains the table of contents and the first 5 pages (123K). Note that because it’s a PDF file, you need the free Acrobat Reader to view it. Like all of our products, Funds to the Rescue comes with a 30-day money-back guarantee. We have tried to make the book as helpful and easy to understand as possible. But if you don’t like the book for some reason, it was damaged in shipment or you have any problems with it, simply let us know. If you don’t think this book is everything we said it was just contact us and send it back for a full refund. Many people have told us that the information helped them, so we honestly don’t think we’ll be hearing from you. We’re confident that reading through all these great fundraising ideas will inspire you and help you raise more money to help animals. So what are you waiting for?